As a second-hand bookdealer I have a few thousand books at home, but my personal library contains a measly three books. One of these is Banquet Ten Courses To Harmony by Annette Shun Wah & Greg Aitkin. 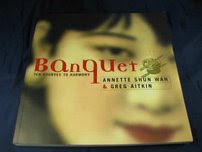 I first picked up Banquet because as a coiffed, angsty, pastey, pointy-shoed teenager I worshipped Annette Shun Wah as she produced and hosted the brilliant SBS TV shows The Noise and Eat Carpet. I was very keen to see what she had to say about Chinese food. Banquet is a celebration of Chinese food in Australia including history, recipes, anecdotes and great photos. It's the history part that really floats my boat, it traces Aussie Chinese food from the gold fields to the 1990s. I particularly enjoyed the chapter on Australia's Chinatowns. In the Aboriginal Dreamtime, a huge rainbow serpent stretches across the land, creating the rivers and mountains of our country. The Chinese of Sydney will tell you that under the Haymarket area lies a winding dragon, protecting the people and businesses of Sydney's Chinatown. The idea of a Chinatown evolved as groups of Chinese settled close together both for a sense of community and as a safeguard against a hostile broader society. This applied in Sydney and Melbourne - Australia's oldest Chinatowns - as much as in overseas communities like San Francisco and Vancouver. Yet the Chinatowns of Australia have a varied history. In Perth, the cluster of Asian restaurants and supermarkets that make up Chinatown is a relatively recent to attract the tourist market. Evidence of the market gardens that once inhabited the area has all but gone. In Cairns, despite all the best efforts of historians and local Chinese, Chinatown no longer exists. In Brisbane's Fortitude Valley, the long-established trading area for Chinese businesses has been tainted by a reputation for corruption and street crime. Newly revamped, it reached a pinnacle of excitement with the filming of the climatic scenes of the movie First Strike featuring Hong Kong action hero Jackie Chan in 1995. Between the ornate arches of Sydney's and Melbourne's Chinatowns, however, has passed people and events that have irretrievably changed that nature of those cities, which the Chinatown of Darwin - although long past it's heyday - was once the commercial hub of Australia's most Chinese city and territory. The story of its deliberate eradication during World War II is fascinating. While there was an influx of gold-diggers during the mid to late 1800s, many Chinese turned their hand to more familiar pursuits, such as fishing around Sydney's northern beaches and growing vegetables, particularly south of the city at Alexandria. When they came into the city to sell their produce, many of them would stay overnight in cheap lodgings near the cattle markets in Campbell Street. So when the city's main fruit and vegetable markets also moved to this area in 1869 - to the current site of the Capitol Theatre - it wasn't long before a new Chinatown was established there. By the turn of the century, there were many boarding houses in the Haymarket area, and much of Surry Hills was also occupied by Chinese households. Hawkers and gardeners continued to lodge in the area on the nights before and after market day, and would visit eating houses such as Quong Yee Chong's cookshop in Castlereagh Street or the Ping Fong Low cookshop in Campbell Street. When the council moved the markets to the Dixon Street area, the Chinese followed. Many had been evicted during slum clearances in Surry Hills, so they began to buy up premises in Dixon Street and Ultimo Road. The Chinese see the three sites as one Chinatown, linked by a powerful dragon underlying the city with its head in Campbell Street, its body winding up Ultimo Road and its tail in Dixon Street. Irene Moss was born in Dixon Street in 1948. Now one of the country's leading public servants, she still has fond memories of growing up in what was essentially a Chinese ghetto. NSW Ombudsman, Irene Moss, photographed in 1950 in a side street in Chinatown where the Sydney Entertainment Centre now stands. From Banquet by Annette Shun Wah and Greg Aitken. The Lean Sun Low Restaurant, now the August Moon, is regarded as Sydney's longest surviving Chinese restaurant. Irene remembers the friendly staff, many of whom were trying to earn money to send home to China. The Chinatown she describes is very different to the one we see today. The community was close-knit, and she felt safe - even as a four year old - wandering to her heart's content. Westerners rarely ventured into the area, and as consequence, Irene did not speak English until she went to school. When she reached school age, Irene had to move out of Chinatown to the suburbs where her older sisters took care of her. School was a traumatic experience, not only because she now had to learn English, but also because of the food. What she was more used to were the substantial breakfasts and lunches prepared by her mother for the family and their workers. There would always be rice, with an array of meat, chicken and vegetable dishes. Dinner was particularly special, as her mother was an exceptional cook, although Irene worries about the consequences of the Chinese love of fatty pork. Perhaps her fondest memories of the area are the sense of community, camaraderie and security that people found in Chinatown. Because of the White Australia Policy, the numbers of Chinese in Australia had dwindled to 6600 in the late 1940s, with half of them living in Sydney. Dixon Street became the focal point for their social lives. King Fong remembers the biggest social occasion of the year - The Dragon Ball, held from 1938 until well into the 1970's at the Trocadero on George Street where huge cinema multiplexes now stand. About 1000 Chinese and 300 non-Chinese would attend, and the Chinese Consul-General would receive the debutantes. The Dragon Balls were a major source of funds for various causes back in China, and it's a little ironic that such a traditionally western style of event was the hit of the social calendar. However,. it also raised money for local charities, and fostered goodwill between the Chinese and influential non-Chinese officials. In later years the funds raised went back into the local community. King Fong's father ran a boarding house for elderly men above his Dixon Street grocery store, the Say Tin Fong. Many of them were retired gardeners and cooks who led quite simple and lonely lives. Their small quarters were decorated with Hong Kong calendar girls and the top floor was reserved for opium smoking. As a young lad, King was not allowed to venture that far up into the building, but he remembers a particularly exciting raid. The old men had devised an ingenious security system at the entrance to the lodging house. Visitors would have to speak into a tin can, connected by string to someone upstairs. If you spoke English you were ignored. If you spoke Chinese, the phrase 'I want to see Charlie' would get you in. Many a drug raid had been stopped dead in its tracks by the system. So the customs authorities enlisted the aid of the fire brigade to break into the premises via the roof at about 3 o'clock one morning, and caught a few opium smokers in the act. They threatened to deport smokers back to China, but China had closed its doors to all outsiders by then. The building was condemned, but being an ex-carpenter, King's father applied to rebuild the rooms. Opium was one of the few pleasures available to these men, who had spent their youth toiling away in gruelling and thankless jobs in order to send money back home. Then, when China closed its borders, they were unable to return to their families. As King Fong remembers it, they felt they no longer had a future. When China's borders reopened in 1973, it was too late. Many of the men were too old to travel back. Three families were eventually reunited when the wives immigrated to Australia, but after decades in lodging houses, the men were set in their ways. They could no longer live with family -- wives and children who were little more than strangers -- and escaped to the familiarity of their quarters in Chinatown. Apart from selling groceries and running the lodgings, Say Tin Fong, like most of the businesses in Chinatown, performed some important services for other Chinese from the same clan. This feeling of responsibility for extended family is the glue that held the community together. Many of the labourers were uneducated, so the businessmen would letters for them, handle finanical transactions such as banking and sending money home, and translate and complete documents on their behalf. King Fong's family ended up in Australia unintentionally. After running businesses in Fiji for nine years, they headed back to China in 1946. Stuck in Sydney for a week, waiting for a connecting ship to continue their journey, they heard about the political turmoil back home, and only then applied to stay in Australia. Under the white Australia Policy, they were only able to stay if they qualified for 'merchant' status. This required them to meet an annual import-export quota. Having learnt to make hamburgers from American soldiers in Fiji on R and R, King's father purchased a fish and chip shop in Ultimo, but to meet the conditions of his merchant status, he also ran an import-export business from the backyard. Many Chinese stayed under the same conditions, which is why so many now are involved with overseas trade... and what better goods to trade than food? When the bamboo curtain came down in the 1950s, the Fong family realised that their future would have to be here. There was no going back. By then they had set up a grocery business in Dixon Street, catering to the local Chinese. Their big break came in the 1950s when cookery writers Ethel Brice and Margaret Fulton started visiting, borrowing cooking utensils to photograph for their magazine articles. Business boomed, their import quotas increased, and the store was filled with tins of chop suey, sweet and sour and the like. King Fong with radio and television personality, Miss Margo Lee, at Say Tin Fong's store in Sydney's Chinatown, 1953. From Banquet by Annette Shun Wah and Greg Aitken. Chinese restaurants were less than sophisticated at the time. Even the Nanking Restaurant in Campbell Street -- which was the only establishment large enough to hose major community banquets -- the lighting was dim, furnishings comprised bare wooden tables and long forms for seating and there was not a tablecloth in sight. The Nanking took up two floors, with VIPS such as the Police Commissioner and the Commissioner of Taxation regularly entertained on the upper floor. The food was pretty basic, unless you could afford shark's fin or abalone. Chinese vegetables were supplied by market gardeners, although with nowhere near the variety that is available today, and bean sprouts came from local Chinese stores. The latest cooking trends and ideas from Hong Kong were sought from visiting cooks who worked on the big passenger liners, or the local chefs would simply eat in the ships' third-class dining rooms from where the ships were in port and attempt to copy what they had sampled. King Fong remembers other early restaurants such as the Teintsin Cafe, named after the port in northern China where the owners had come from, and the Shanghai Cafe which had an 'English' dining downstairs and a Chinese one upstairs. He also recalls the Bamboo Restaurant in King Street with its basic chop suey and sweet and sour dishes mainly catering to a western clientele. Most of these eateries closed during the 1960s. While Nanking was the top society restaurant -- mainly because of its size -- during the 1940s and 1950s, its place was taken by the New Dixon restaurant, the Mandarin in George Street and the Sun Ah during the 1960s and 1970s. In the boom time of the 1980s, the Marigold and the glittering Regal in Sussex Street held many of the major functions in Chinatown. Now the places to be seen in Chinatown are the Citymark Marigold, the East Ocean Restaurant, the Golden Century and Kam Fook Shark's Fin and Seafood in the Peak complex. These expansive Kam Fook does a roaring trade in yum cha which you'll read about in Chapter 9. Banquet Ten Courses to Harmony by Annette Shun Wah & Greg Aitkin. Published 1999 by Doubleday, isbn 0868247480. This book is out of print, try ebay, amazon or www.abebooks.com.au. Now and again we have it in the foodie section of our eBay store. Very Thai, a wonderful book on Thai popular culture. This is still in print at the time of writing, available from the wonderful Asiabooks. The Robert Crumb Coffee Table Art Book. I bought this book to give to my brother as a birthday present, but deep down I really know I bought it for myself, so did my brother, so he gave it back to me. Hence selling this book would be bad karma. Banquet looks fascinating! I'd so love to read it, and another great post Mr Shawn. The Crumb Coffee Table Book is amazing – I have the original HUP which features the "Are You Prepared to Face Eternity?" – just amazing. His new Illustrated Genesis is magnificent, as is his Crumb's Blues Heroes. And if you can find it – I did in Gould's in Newtown – look for his first ever book, out of print and hard to get, called the Yum Yum Book. A brilliant piece of juvenilia. Thanks for the tip Sunbad, on the word 'juvenelia' - love it! Great stuff, Really interesting account and perfect for my project. Annette's comment about the August Moon being the old Lean Sun Low is not accurate. As a little girl visiting Sydney in the 60s and 70s from Brisbane and Say Tin Fong and my late Uncle's gambling joint upstairs from the August Moon I can say definitely they were two very separate restaurants. I'm about the same age as Annette and if Greg Shun Wah is related to her, we know the Shun Wahs too. My Uncle Robert Yuen used to own the August Moon and it was underneath his business premises which was where many of the old Chinese from Dixon Street and thereabouts used to gamble and smoke playing mah jong,, amongst many other games. Lean Sun Low did the best silky smooth won tun mein and long soup. Business people of all persuasions would line up for the offerings from this very humble cafe where I think you had to walk down a step or two from street level. Certainly Say Tin Fond was like this. It was a treasure trove The smells reminded me of Chinatown in Brisbane - where you could see and hand pick from big open barrels and sacks of various dried products. There was the smell of incense and salty plums, fermented black beans and dried fish and jang and shitake mushrooms. Uncle Robert had a lady friend called Winnie. He was one of the many sons borne by Yuen Het Hing and his wife,including my grandfather Harry Quan, who are all decendents of the Yuen clan which was one of the ten great Chinese clans to populate Australia from the 1850s onward around Pine Creek and Palmerston in the Northern Territory. You can see more of this history in the Chun Wah Museum in Darwin. We're all listed, including me, Tricia Quan and my mum and dad, Norman and Irene Quan. Most of us are Hakka. There are lots of other books available about Chinese history in Australia including one called Astronauts and Dragons or something like that. Wow Tricia, what a thoughtful and insightful comment. We would love to get to the Chun Wah museum, what a great excuse to get to Darwin. And we will be on the hunt for that book. I recently found a great planning document and survey of Chinatown residents in the 1980's but have been looking for anything on its earlier history. I would love to see photos of these old places and match them up with the current buildings, do you know if any exist?